Any excuse to whip off his top. Looks like it wears pants and it got no hair on the upper body that we can see at least. Unfortunately it was impossible to sharpen the face. That specific figure does not appear among the photos recovered from the Dyatlov party's cameras. If it is authentic, the setting would most likely place the photo's scene in the area of the party's last campsite prior to the fatal one. They'd attempted to ascend the pass at the end of a day's travel, only to retreat from high winds to the forest below. They pitched their tent and camped one night before building a cache and ascending the pass the following day. They took multiple photos at this penultimate campsite. 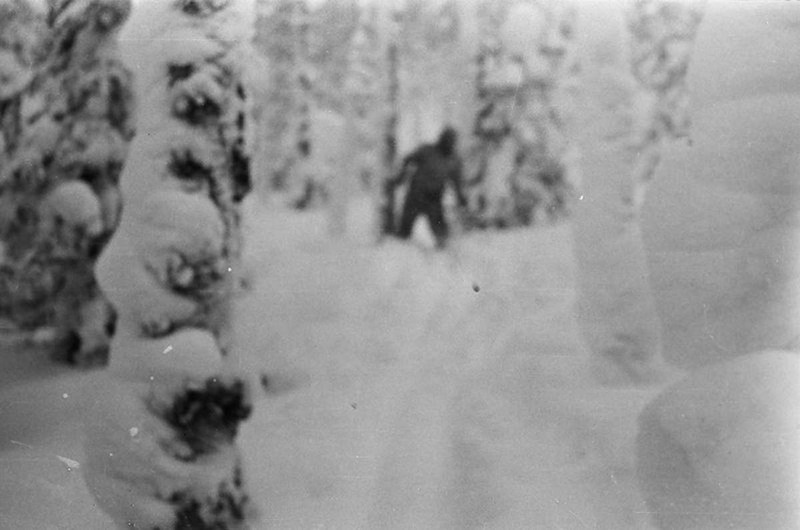 Among the doomed trekkers' photos are multiple ones showing one or more of the party approaching the camera in deep snow among trees. This particular figure and the specific trees / tree arrangement do not appear in any of these quite similar shots. I cannot locate any wider angle shots from which this figure may have been excerpted and enlarged. There are also multiple, quite similar, photos taken of the search party (weeks later ... ) in the course of locating and examining the penultimate campsite and the cache. I can't find this specific figure / scene in any of those photos. I would also point out that journals were kept by more than one of the Dyatlov party's members - not one of whom mentioned seeing any strange figure(s). Dyatlov's own journal includes an entry from the last night before ascending the pass. In any case, I'm confident that if the photo indeed comes from the fatal trip the figure is one of the male trekkers wearing his hooded jacket. (Both females wore longer parka-style coats.) If you look at the left leg you'll see what appears to be a gathering of the silhouette at the knee, along with a noticeably lighter area below. This is consistent with the leggings / gaiters all of them wore. ... you can see the twin tracks of the skiers' trail in the foreground. This 'looking back down the trail' perspective is the same as seen in other photos the party took. Considering the denisovan DNA the himalayans are meant to have, how much do they share with the rest of us? Yes but we are told some people have 2 to 4 % neanderthal DNA while others don't. But Neandertaks,Denisovans, are humans too. Depending on how you define it. Untill recently we had no idea denisovans existed. So which humans is the DNA 99% similar to? No, it's not a question of definition, Denisovans and Neardertaks are human. Perhaps not the same soecies or sub-specues as us, but definitely human, and sharing a very recent common ancestor. I've not made it to the end of the video yet, but it's just an entertainment programme. To be fair, even if it's wrong, most of us probably define "human" as the precise sub-species that we belong to, so that clarification is probably a necessary one. The article's from 2015. They present an interesting viewpoint about why we made it and the Neanderthals didn't. Despite possible interbreeding we (w help of our canine friends) may have driven them to extinction vs. a general melding of hominoids? I think what is meant is the one percent is diffrent to any human genome meaning its also different to the Europeans who have neanderthal DNA in them. We have neanderthal and denisovian genomes mapped. This popped up on Quora earlier and a quick Google shows variations on the story have been bouncing around for 4 years or so. Remains of an archaic but remarkably well-preserved hominid found in Himalayan cave. Some articles suggest it is a Homo Habilis. Seems unlikely, but has the account actually been debunked yet? Was this DNA shared with other scientists? Don't know yet. I'm going to try and contact Mark Evens. This is as fake as a cake baked by a fakey cake maker. The picture is a still from the great horror flick Horror Express (check it out, it has the feel of a 1970s Dr Who story). One of my fave horror flicks along with Q The Winged Serpent. The plot reminds me of 70s Doctor Who. Yes, two great pictures there. Saw Horror Express quite recentky, but haven't seen Q The Winged Serpent for years. I'd add The Night the Demon too. "Horror Express" and "Night of the Demon" great movies. The Q the Winged Serpent not so (IMO). Any thoughts on the "Yeti fingernail" detailed in one of the forum pieces of FT 379? Apparently this cryptozoologist Hans-Jorg Vogel has had it tested and it's not human - or a hoof of an ungulate, either. Must admit it looks to me like he could grow his own specimen like Oddbod Jr in Carry On Screaming.